Have you ever had the sensation of rolling uphill backwards? You can do just that by visiting a spot well known to locals in northern Michigan's Benzie County as a "gravity hill" with a "magnetic" church! Do visitors experience a gravitational anomaly, a spiritual pull, or some mysterious paranormal force at work? Throw your car into neutral at a certain spot along the county's Putney Road and experience this strange sensation for yourself as we did earlier this year. I'd read about this natural mystery spot years ago, and we finally checked it out for ourselves earlier this year. Putney Road is a few miles from a lot of places, and pretty much in the middle of nowhere. 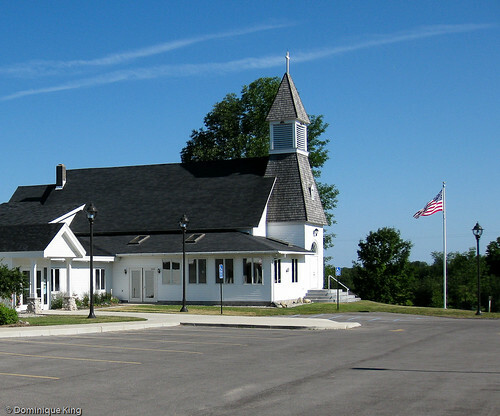 The Blaine Christian Church sits on the corner of Joyfield and Putney Roads in Benzie County, but the rest of the township is pretty much a ghost town. Blaine Township enjoyed a brief heyday as a sawmill center in the early 1890s at a town called Watervale. Residents pretty much abandoned the town by the mid-1890s and most of that area became a summer resort in 1917. Today, the entire township has only 491 residents (according to the 2000 census). Blaine Christian Church, on the southwest corner of the intersection at Joyfield and Putney, was established in 1895 and figures prominently in the mystery of Putney Road. Some stories claim that a sort of spiritual magnet pulls sinners back towards the church along the road. The more conventional and scientific explanation says visitors experience an optical illusion that causes them to believe they are rolling uphill and backwards when they actually roll down a slight grade. 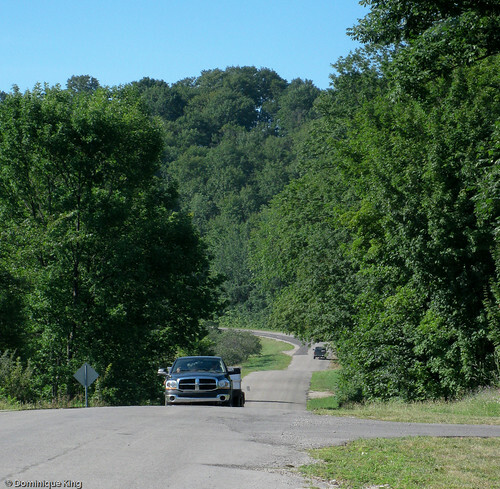 This hilly section of road has a slightly obscured horizon, making it difficult to judge slopes because there isn't a reliable reference point, and people often tend to overestimate the degree of a grade. Trees that aren't exactly vertical can also help trick visitors into thinking they are going uphill when they are really going downhill. Reach the Putney Road intersection by traveling on Joyfield Road from either M-22 or M-31. Turn south on Putney Road from Joyfield and drive about 100 yards to what appears to be a slight dip at the bottom of a gentle downhill grade. This spot is just before a curve in the road and near a stand of pine trees. Stop the car, put it into neutral, take your foot off of the gas pedal, and see if you don't feel like you're rolling uphill backwards! The day we visited, we amazingly had a little trouble finding the road entirely empty of traffic so we could try this. We did manage to eventually replicate the sensation of rolling uphill that other visitors report, though. Check out Weird Michigan: Your Travel Guide to Michigan's Local Legends and Best Kept Secrets by Linda Godfrey to read about a couple of Michigan's "mystery spots" (including Benzie's Putney Road) and many other roadside oddities in the state. There is a place like that in Florida. I haven't visited it but people claim to go backward uphill. It's in an equally remote spot. I've heard of a few other places like this in Michigan, including one in a nearby cemetery I'd like to check out one of these days. It really was a strange sensation when you started to roll "uphill" and backwards! Craig-Thanks for stopping by. I've found a lot of similar "mystery spots" listed online since I started looking for them. Happy travels! I WOULD LIKE TO KNOW MORE ABOUT PLACES SUCH AS THIS. I TOLD SOME PEOPLE AT WORK THATI POURED WATER OUT OF A CUP AND SAW THEWATER RUN UP HILL. NOW ONE BELIEVED ME AND THOUGHT I WAS CRAZY. I've heard that some folks have used a level and tried filming it when they're at a mystery spot like this. We didn't think to do it, though. I have been there with a level and what "appears" to be up hill is actually down hill it's just a neat Optical Illusion. Gravity Hill!! The story i was told was a witch had a house down the hill in the orchard. A young boy was killed by the witch and his spirit is pulling you away from her and to the church where it is safe. Loved going there as a kid and loved taking my kids there as an adult. I grew up a couple of miles from there and checked road elevation with a transit. It's an optical illusion. Been there many times. Best time to go is at night. Adds to the Plus makes it easier to see cars coming from behind. There is a corner just behind the gravity hill and cars come around fairly fast. Enjoy.